Courtesy of Wade on Birmingham and The Birmingham News, Barack Obama is back in Alabama again. He will be in Huntsville today and Birmingham tonight for fundraising events for his campaign. Now what surprises me is that you can attend the lunchtime affairs in Rocket City for anywhere from $1000 to $2300. (Yikes! That’d better be some good soup!) But dinner in Birmingham will only cost you $25. Yup, less than a tank of gas, that Obama is a cheap date for the Magic City. I won’t be going, no sir-ee Bob; but I would be interested in hearing real answers to key issues rather than the tired rhetoric that’s currently posted to his website. Don’t tell me what you think I want to hear, tell me what you actually PLAN to do about the problems in this country — because brother, you haven’t said anything to impress me YET! do you mean (we Americans) ? (we white people)? or (we tax payers)? if you mean Americans, she is as much of American as anyone. If you mean white people, then many types of people pay into the scholarship programs. Many people were born in Muslim countries/ homes and were lead to Christ. Does that make you more Christian than they are?? Does that make them any less of a Christian?? Are you willing to confess that to the face of Jesus? First, I do need to say that this was a forwarded email. I missed the PS. I need to do a little better job of editing. So thanks for that. Yes, that may be true, but generally those folks have professed their devotion to God, believe in him, try to live their lives according to his works. a TRUE Christian and I am ready to face God with that. I’m not asking God to send people to hell, just make sure they don’t come from there to put their pinky finger on a button in a certain oval office…. I try to be open minded on most issues but in the one comment that Backstick posted from someone else…the female with 2 kids…well, I feel the same as she does…I have 2 kids, one is a sophomore in college studying to be a chemical engineer and one that decided when she graduated this spring that she just wanted to work and forego college. I have been a stay at home mom for 11 years and I want to know that my kids will be safe out there in this world….along with my grandchildren some day. I have a problem with Barack muslim history…9/11 was a horrible day…and it showed us that this country can come together and be as one when needed….there is still compassion here. The Muslim put a hurt on our country that day…and it wasnt the first time. I grew up with a flag in the classrooms saying the Pledge of Allegiance every morning before the class started…what our country is based on. Barack says he will give us CHANGE….what kind of change?? Change is what has gotten us into some of the problems in this country…such as…taking god out of the schools, and other public places. Not allowing parents the rights to discipline their children (I’m not saying to beat them but to be able to correct them while growing up). If there is a child that his/her family doesn’t believe in God then it should have been that families choice to let them sit quietly at their desk until it was over. Because this is America. CHANGE??? Is this going to be giving the people from other countries handouts with our social security/welfare that we pay into and they dont. CHANGE??? Will this be the doctors that come over from foreign lands for 11 months out of the year and go back home for a visit and not pay ANY taxes? CHANGE??? Is he going to leave all the welfare people sit and sleep and be on food stamps again…like Clinton did…Clinton more or less told welfare recipients that as long as they had children under a certain age they didnt have to work. I understand that some people are down on their luck and need a helping hand but not hand outs for life. CHANGE?? Is he going to take funding away from the military to give to the welfare? Ask a soldier who they are voting for…most likely you will hear McCain/Palin this year. I believed wholeheartedly in Democrats growing up. I come from a long line of Union workers. To this day, my dad is a Democrat, but I married a Republican and we had debates and now I look at facts before making my choice. I live in Indiana and I am proud to stay that I will back Mitch Daniels each and every year! When the Bayh’s then the O’Bannon’s were running this state we were almost in bankruptcy and Mitch Daniels has pulled us out of it! Ok..time to get off my soapbox now….thank you for the freedom of speech….will we still have it after the election? Sorry – computer got screwed up. 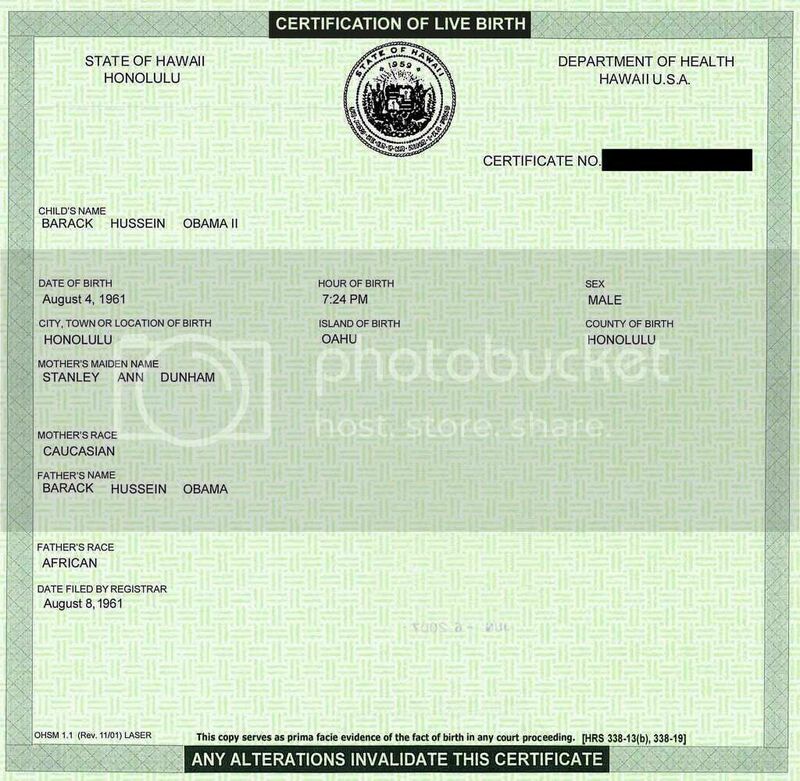 I meant to say that the simple truth is that Obama’s birth certificate was made available for viewing in 2008 at http://i305.photobucket.com/albums/nn227/Polarik/BO_Birth_Certificate.jpg. Barack Obama has never been Muslim and never practiced Islam. But rumors about his religion intended to frighten some voters persist, and they mostly return to one point of fact: his name. â€œBarackâ€ is the candidateâ€™s Kenyan fatherâ€™s name; Obamaâ€™s middle name, â€œHussein,â€ is his grandfatherâ€™s name. Obama has described his father as atheist or agnostic. His Kansan mom, whose grandparents were devout Protestants, lived a secular life. Obamaâ€™s only personal contact with Islam came as a boy when he moved to Jakarta, Indonesia, with a stepfather who mixed his Islam with Hindu and Animist traditions. In five years there, Obama attended a Roman Catholic school, then a public elementary school, where he sat through a class each week of religious studies. As an adult, Obama turned to Christianity in the late â€™80s in Chicago, at Trinity United Church of Christ, where he was baptized, marriedâ€¹and baptized his kids. As a new U.S. senator, Obama took his oath on the family Bible. Obama is a member of the United Church of Christ. His Kenyan paternal grandfather and Indonesian stepfather were Muslim, but he attended secular and Catholic schools and was never a practicing Muslim. You are so mislead. The fact as to whether or not Obama is Muslim can be argued until the cows come home but you’ve only to read his books to know that he hates white people. I know, you’re going to say that his mother was white but in his books he wrote that he has disowned his mother’s race. I would not vote for a white man who hates the black race, nor will I vote for a black man who hates whites. The president should be the president of all races. Besides, look at the friends he chooses. What type of friends will he choose if he is elected? why is it that americans hate muslims so much? cant an American Muslim run for presidency? the color of your eyes is insignificant neither is the color of your skin. So people grow up and stop being racist. It is not about race Barack Obama is going to tear down our country and take the pleage of alegents out of schools and I would not be surprised if he changed the flag and printed money with his name on it. He scares the HELL out of me!!!! You people are too much. Obama is the way to Peace, Hope, Charity, and Love!!! To “foreigner”— I see you’ve been drinking a lot of Kooldaid. Drink up & have a nice trip until the nightmare begins. You sound as if you’re from the 60’s- flower era group. Shame on you. You should have gotten some smarts by now. Listen Sansom, it seems the Muslims hate us, or have you forgotten September 11th? Barack Obama no record, Mc Cain had contribuuted as USA Soldier and prisoner in Vietnam. Where’s came from Obama money for campaign? Dignity friends. Most families Obama is moslem and atheist, so why Obama choose Democrat meaning democrazy. What’s Obama relationship with Rashid Khalidi from Palestinian. what’s patriotism Obama, he is just guy who ambitious. what’s his record, how many college man tought better than him, no experienced. Can’t change better USA. And don’t forget…With Obama, you can abort (murder) your children up until your due date at tax payers expense! Even use stem cells from their deaths to cure diseases you’ve encounter from working the streets. But the one thing you better not do is defend yourself, at that point, your tongue will be cut from your mouth and fed to the dogs. It looks like the country is in big trouble. People will be sorry when things start going to hell. It won’t be immediately, and it will be made to appear as though Obama had nothing to do with it. Susan, I agree with you totally. Except stem cells can be obtained from the umbilcal cord immediately after a live birth, so you don’t need to murder innocent babies to get it. An abortion should only be done if the mother’s life is in danger. I mean medically in danger. It should not be used as a form of birth control. Barack Obama is a Moslim, and he should NOT have been allowed to run for President of this country.He may have been born in this country, but left it to go back to Indonesia to go to school, so he IS NOT a Natural born ciutizen. Further more if he is an American citizen, why wouldnt he provide his birth certificate to prove it, what is he hiding. I cannot believe most of what I read in this website. I agree completely with Victoria. And the issue of race was brought up before (just look at berryann’s comment). You want to know something; that so-called “muslim,” he’s now the PRESIDENT of the United States of America and guess what all you racist and anti- muslim motherfuckers you are going to have deal with it and what!!! LMAO. You must all be dying in the inside because he won.